Signing up for Secret Cinema was a leap of faith. Accustomed to making informed choices about which screenings to attend, I placed blind trust in those behind Secret Cinema (Future Shorts/Tartan Video) to come up with something worth passing Sunday evening doing. Firstly I had received an email with instructions and directions for the day. But this didn’t arrive ’til five hours before the event. Not only that, but the directions instructed us to bring warm clothes. Where were they taking us?! 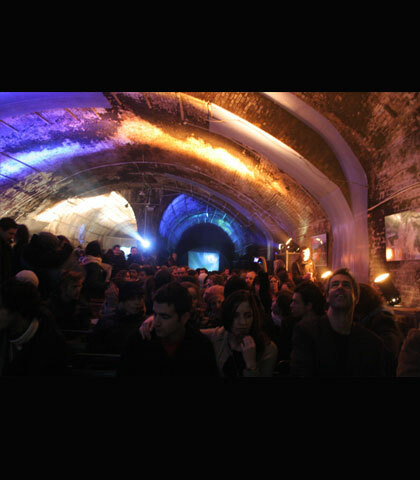 Would we be watching a film in a wind tunnel? Perhaps I was about to watch a silent movie reflected in the cold water of the River Thames? I was sceptical. But walking towards the venue I felt a shiver of excitement. I knew I was in good hands and I liked the fact that I had no idea what I was going to be watching. Turning the corner I found the alleyway next to a London Bridge boozer teaming with people in fur coats and hoodies, and a Secret Cinema logo projected onto a brick wall. Adding to a sense of privilege about being in-the-know, my existential twins and I waited around by some fenced gates while those without tickets were turned away. When we were let in, my pathway was stalled by an errant skateboarder who lurched in front of me, then fell to the ground. Stranger still was a high-school locker installed by the entrance, and further on a television showing a Fox-style news broadcast. Moving in under the railway arch was a mock classroom past which several more skateboarders whizzed. Catching site of a skate video projected onto a wall it became clear that we were about to see Paranoid Park – the latest Gus Van Sant film. Where better to see a film about a death on a railway track than in the dank underbelly of London Bridge? Obviously a skate park in Portland would have been spot on, but given the circumstances they had got it just right. Relaxing into the closely-packed plastic seating I was relieved to have bypassed the overpriced sodas and garish bowling-alley style décor of the cinema. Maybe, just maybe Secret Cinema could bring back the sense of magic to the cinema-going experience, and if not then it certainly felt like it had more soul than the local multiplex. My one qualm was that it might be a cheap shot at publicity. Rather like the drag queens hired to rev up the audience at showings of Showgirls. Not so, according to Fabien Riggall, founder of Future Shorts and the one behind the conception of Secret Cinema. ‘It’s not going to be just pre-releases. It’s really going to be a mixture of strong pre-releases, thought-provoking animation and old, classic films. It is about showing films in a different environment as cinema-going has become so formulaic in my view’. And perhaps Secret Cinema can tempt even the most discerning film buffs away from their carefully considered to-see list and into the dark corners of the city where mystery and intrigue still rule.